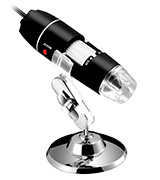 The microscope features an LED light shining down on the stage that, in turn, provides the user with the opportunity to closely examine solid objects like coins or insects with the x40 and x200 magnifications. Furthermore, the LED lighting comes with a switch that you can toggle to use under lighting in order to examine standard microscope slides with magnification up to x800. The attache case is sold separately. 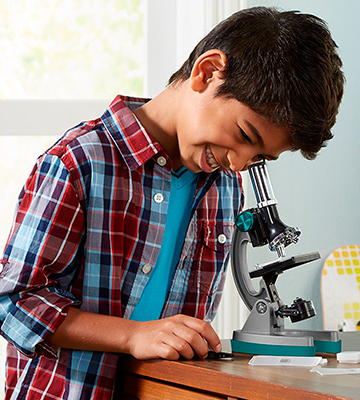 The New Apex Learner Microscope isn’t just a great children's microscope that features some unique for its price range options but a complete starter kit that, along with the series of instructions, will allow a young scientist to start experimenting straight out of the box. 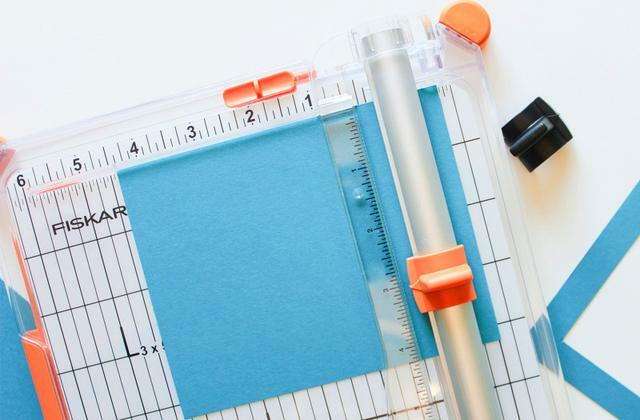 Aside from the microscope itself and a set of professional slides, you will receive 40 different tools and instruments that will allow your kid to make some slides on his own. The model also offers 5 different magnification options, including a 50x, 100x, 150x, 300x, and 600x. If you would like to raise a future Nobel laureate or simply prefer your kid to give the world of science a whirl, leave it to professionals at Learning Resources with their MicroPro Microscope to deliver a comprehensive set of tools capable of sparking a long-lasting interest in a young mind. The device is really easy to use since all it takes is two AA batteries and a flick of an ON/OFF switch to get the whole thing running. 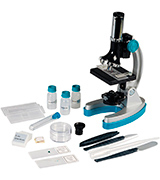 In addition to the microscope itself, you will also receive a pair of tweezers, two test tubes with caps, slide covers, and virtually everything that is essential to start dissecting specimens right away. The number of additional accessories is rather limited. 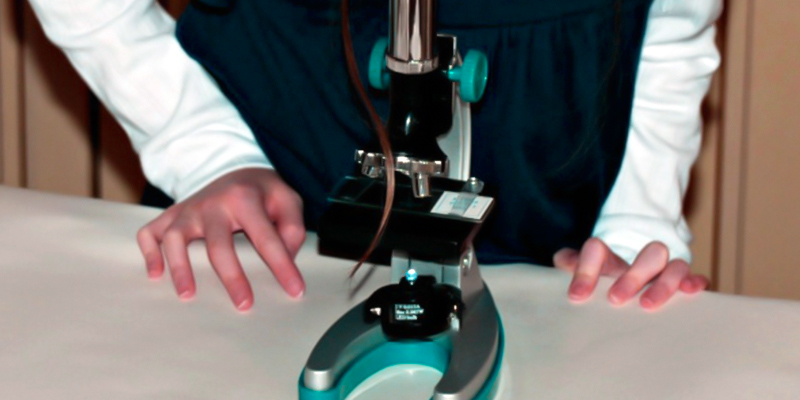 The DeeXop Microscope is a great choice for beginners and the kind of model that will be perfect for homework. 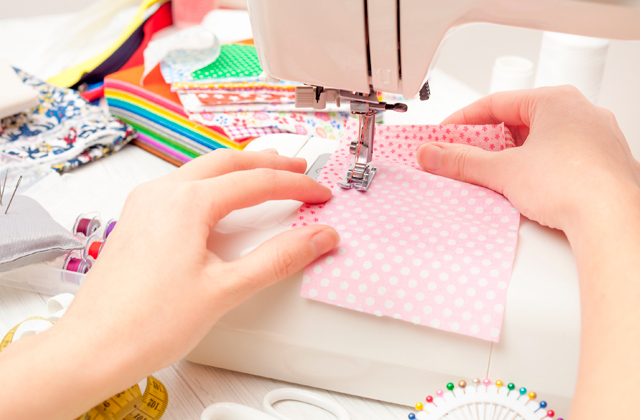 The kit isn’t as all-inclusive as some of the other options might offer but it will be more than enough for school projects. 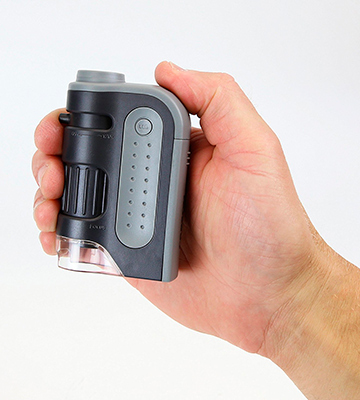 Despite the compact, lightweight, and portable design, the model does not intend to trail behind in terms of performance, offering a magnification range of up to 120x that you could change with a slight twist of the knob on top of the microscope. 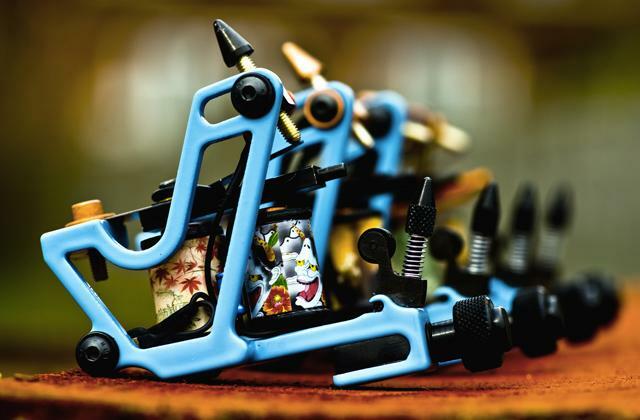 Below that, you will be able to find a focus adjustment wheels that wraps around the entire body and provides some extra control in the focus department. The magnification is lacking compared to stationary microscopes. 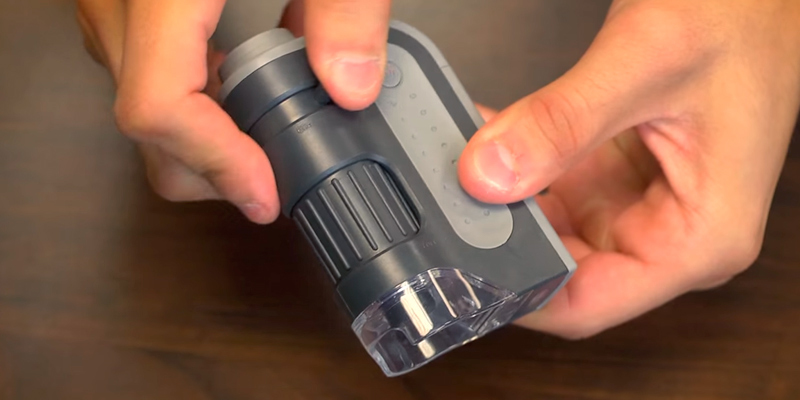 The Carson MicroBrite is a portable microscope that will be able to satisfy adults just as well as it’ll spark the interest in science in children. 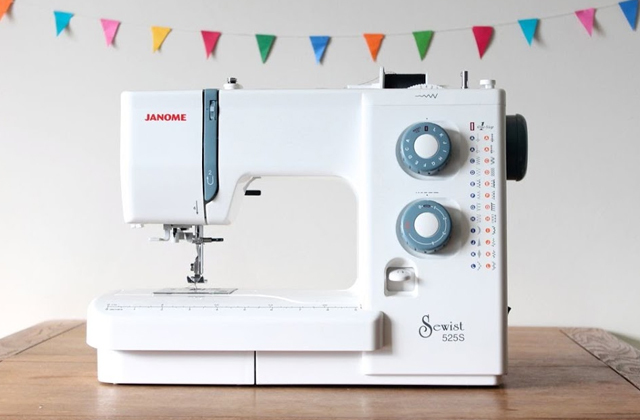 The model is as compact as it gets and no assembly is required in order to operate it. 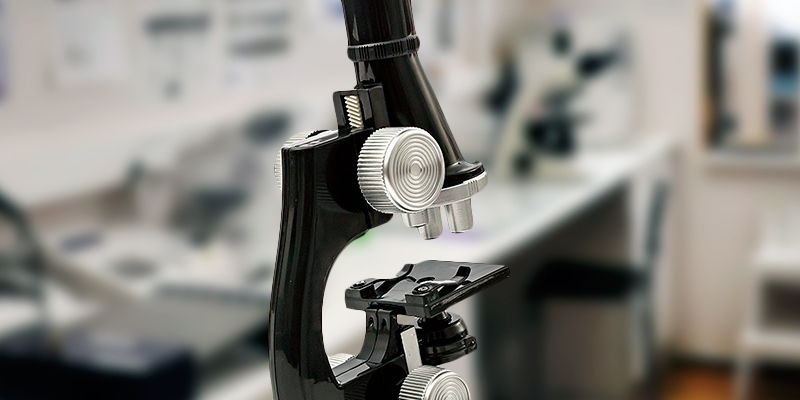 Though the product in question is fairly impressive just as a microscope, featuring a magnification range from 40x up to 1000x, its main selling point is the ability to connect to a multitude of different devices. 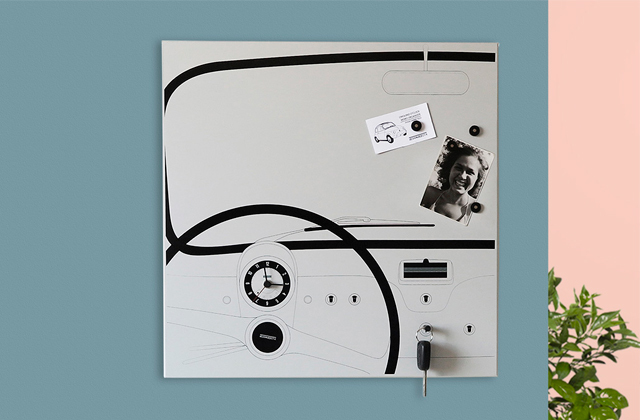 Connected to a PC or a smartphone, the model will allow you to utilise software to record the micro world, capture screenshots, and record video. The stand isn't quite heavy enough, so the device might fall over. The Jiusion 1000x is a USB microscope that combines the regular functions of a microscope with the latest advancements in the world of information technologies, making it a great choice for experienced scientists and for the newcomers. You probably don’t need us to tell you that the fields of physical and biological sciences are a fun and exciting world to explore. After all, it isn’t you but the bright young minds that we’re supposed to convince that science isn’t just a tool that adults use to bore children out of their gourds but actually a world full of endless possibilities and intriguing new concepts. And, sometimes, the right tool is all you need to convince a youngster to give the world of research a shot. Or, in the case of the The New Apex Learner Microscope, a complete set of tools and instruments that could even make some adult research workers drool with jealousy. Though the price may seem a bit steep at first, aside from a noticeably improved model to replace the previous iteration of the Apex microscopes, the company offers a complete commissioning set that includes prepared slides, plain slides, coverslips, forceps, a pipette, a test tube, and a probe. 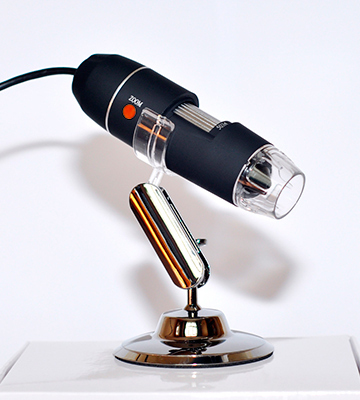 The microscope itself features an LED light shining down on the stage that, in turn, provides the user with the opportunity to closely examine solid objects like coins or insects with the x40 and x200 magnifications. Furthermore, the LED lighting comes with a switch that you can toggle to use under lighting in order to examine standard microscope slides with magnification up to x800. You will be able to obtain these magnifications with the help of three turret mounted objectives that, by working together with x10 and x 20 eyepieces, will allow you to reach the said magnification level of up to x800. In conclusion, The New Apex Learner Microscope isn’t just a great children's microscope that features some unique for its price range options but a complete starter kit that, along with the series of instructions, will allow a young scientist to start experimenting straight out of the box. As some parents are probably aware at this point, Learning Resources isn’t just another commercial enterprise that makes different toys for kids to fool around with. This is a company that is dedicated to educating children and sparking an interest in hard sciences from the very young age. 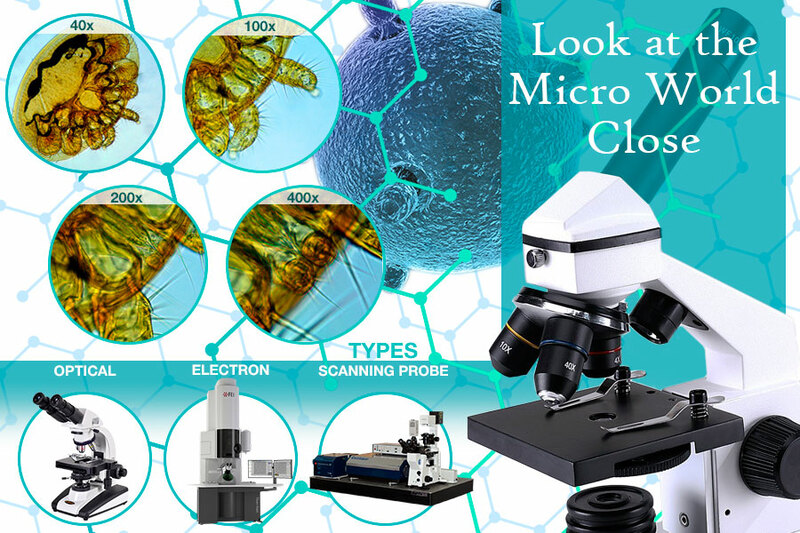 With over 30 years of experience under their belt, these are exactly the kind of people you ought to put your trust in and the Learning Resources MicroPro Microscope is another suitable example as to why that is the case. Despite what the title may suggest, you won’t just receive a set in stone microscope for kids but actually a complete set of scientific accessories. In it, you will be able to find a selection of professionally prepared slides and everything that a young brilliant mind could require to create his own projects. Aside from a microscope capable of providing from 50x to 600x magnification and the aforementioned prepared slides, you will get up to 40 different pieces of equipment, including a pair of different magnification eyepieces, a scalpel, a spatula, a stirring rod, a pipette, a test tube with a cap, a petri dish, a pair of tweezers and three specimen vials, that’s not to mention eight blank slides, eight slide labels, and 16 slide covers. Suffice it to say, this should be more than enough not to just spark an interest in STEM and other hard sciences in your kid but also to maintain it in the long run. And, at the end of the day, this is what the product is all about. If you would like to raise a future Nobel laureate or simply prefer your kid to give the world of science a whirl, leave it to professionals at Learning Resources with their MicroPro Microscope to deliver a comprehensive set of tools capable of sparking a long-lasting interest in a young mind. Though the world of science and research can certainly serve as an exciting and thrilling prospect for millions of children all over the world, not everybody is cut out for it and not everybody will be able to find it particularly interesting or intriguing. And that’s perfectly fine, sometimes that interest might spark once the kid actually starts practising with a proper piece of equipment and other times your kid’s talents may lie in a different area. Of course, you’ll never know until you try, and the public school system, for all its faults, always makes sure to involve the children in an introductory course of research. Problem is, the school doesn’t always offer the right equipment, and that is why any parent could find some use for a DeeXop Microscope. This model isn’t just a key scientific tool but also the best choice for your children's homework. First off, it is incredibly compact, with just about 18 x 8 x 26 centimetres of overall dimensions. The device is also rather light, featuring less than 400 grams of weight. Among other things, it is also really easy to use since all it takes is two AA batteries and a flick of an ON/OFF switch to get the whole thing running. Though not the most powerful option on the market, this light microscope is capable of 400X magnification, and that is where a set of LED lights will inevitably prove themselves useful. 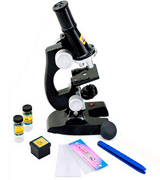 In addition to the microscope itself, you will also receive a pair of tweezers, two test tubes with caps, slide covers, and virtually everything that is essential to start dissecting specimens right away. 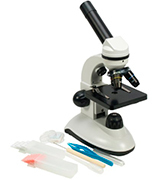 All in all, DeeXop Microscope is a great choice for beginners and the kind of model that will be perfect for homework. 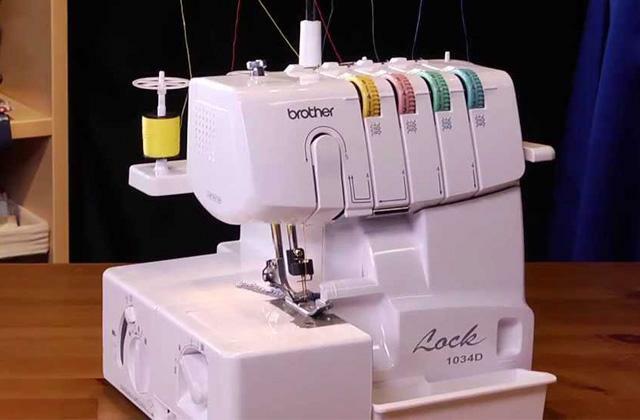 The kit isn’t as all-inclusive as some of the other options might offer but it will be more than enough for school projects. 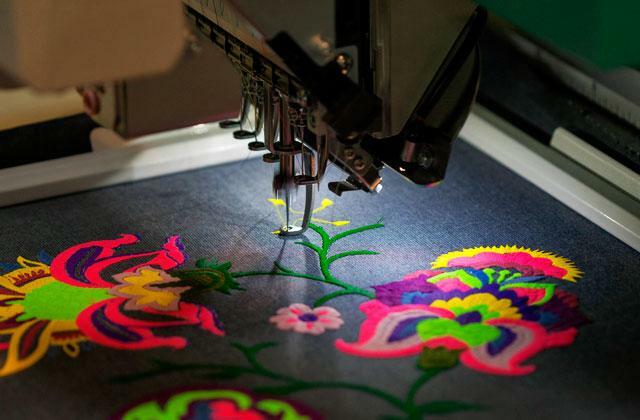 Carson MicroBrite is a bit of a different option compared to other entries on our list. 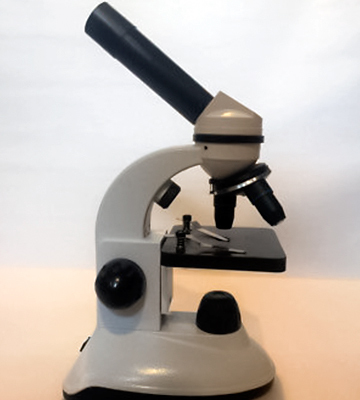 Where all of the other models offer a solution for beginners, this is a portable microscope that could suit experienced adults just as well as youngsters that are just starting their journey in the world of science. 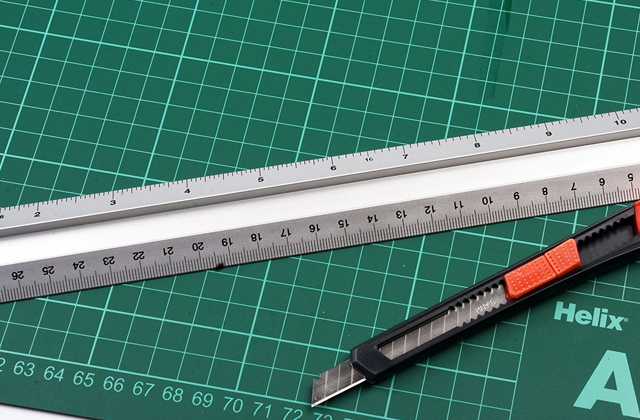 Now, given that this is a portable apparatus, the item’s dimensions are the most logical place to get started. 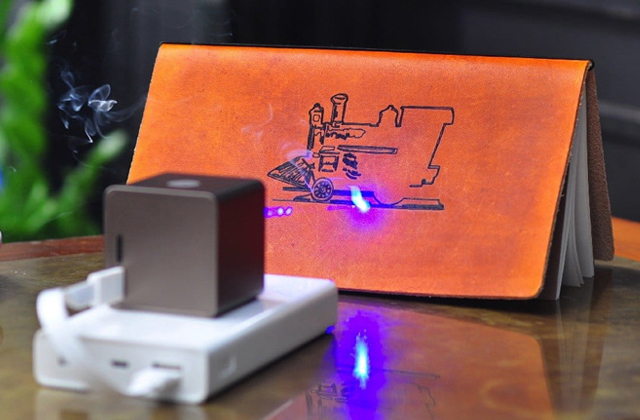 Though not the only area where this product shines, just about 5.6 x 3 x 9.4 centimetres of overall dimensions and a minuscule 13.6 grams of weight is a set of numbers that is nothing short of impressive. As you might imagine, even the smallest kid could simply drop this thing in his pocket and he wouldn’t even be able to tell that it’s there until he needs it. 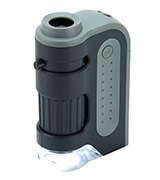 Despite the compact, lightweight, and portable design, the model does not intend to trail behind in terms of performance, offering a magnification range of up to 120x that you could change with a slight twist of the knob on top of the microscope. Below that, you will be able to find a focus adjustment wheels that wraps around the entire body and provides some extra control in the focus department. Another interesting thing about this pocket microscope is that it utilises an aspheric lens and that means that the light rays converge at a single focal point resulting in a more sharp, clear, and distortion-free image. And a bright and relatively powerful LED light will allow you to enjoy all of the intricacies of the aforementioned image. To sum it up, the Carson MicroBrite is a portable microscope that will be able to satisfy adults just as well as it’ll spark the interest in science in children. 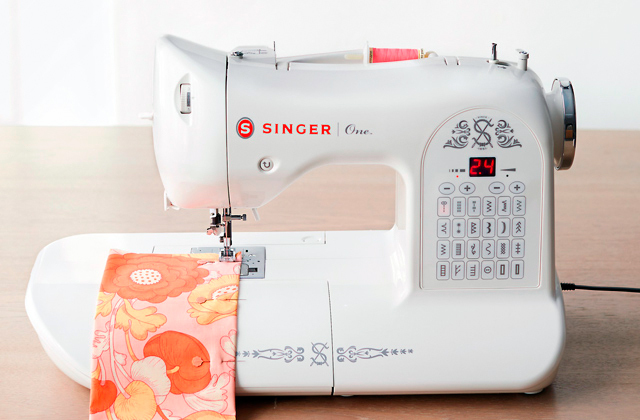 The model is as compact as it gets and no assembly is required in order to operate it. The world of information technology evolves at a rapid pace and it is up to the rest of the world to catch up to it. Suffice it to say, people in the world of science understand it better than anybody, which is why even the tried and tested devices like microscopes are starting to incorporate these technologies into their methods. 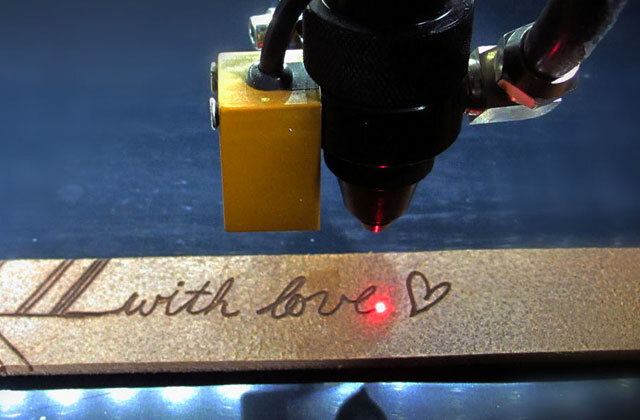 A good example of a model like that is the Jiusion 1000x, a digital microscope that offers an array of additional options to its structure. 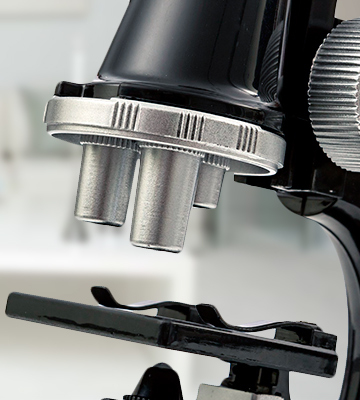 Though the product in question is fairly impressive just as a microscope, featuring a magnification range from 40x up to 1000x, its main selling point is the ability to connect to a multitude of different devices. Connected to a PC or a smartphone, the model will allow you to utilise software to record the micro world, capture screenshots, and record video. On top of that, you will also be presented with an opportunity to use the software's measurement function in order to accurately measure even the tiniest elements of your work. While there's always the question of lighting, the 8 built-in LED lights that the model comes equipped with will be able to provide more than enough illumination for even the most demanding science enthusiasts. An adjusting knob will allow you to change the brightness of these lights as well as the focus of the 2 MP mini camera. And, finally, the said camera will let you shoot videos with an impressive frame rate of up to 30 frames per second. 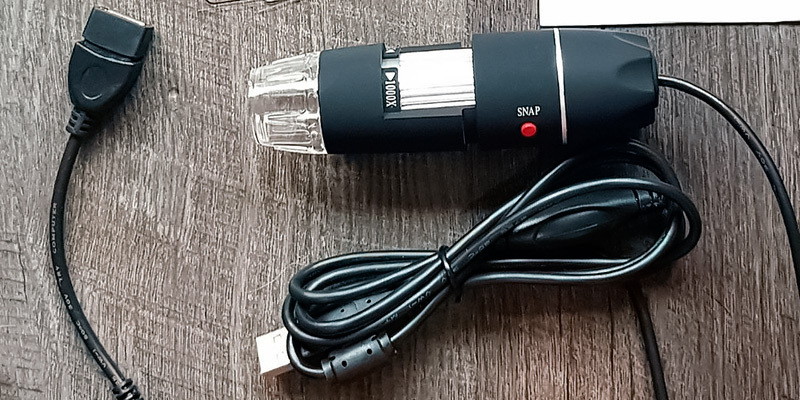 Now, to bring this review to a logical conclusion, the Jiusion 1000x is a USB microscope that combines the regular functions of a microscope with the latest advancements in the world of information technologies, making it a great choice for experienced scientists and for the newcomers. The world of science is a world that is full of excitement and wonder, a field of innovations, breakthroughs, and discoveries. Now, it certainly isn't a world for everybody, and it definitely requires a certain mindset and an amount of patience that very few people would be willing to spare. On top of everything else, this little endeavour also requires proper equipment in order to conduct the scientific experiments. Luckily for the customers, an instrument that is capable of providing a window to a world that they otherwise wouldn’t be able to see has been steadily dropping in price over the years. 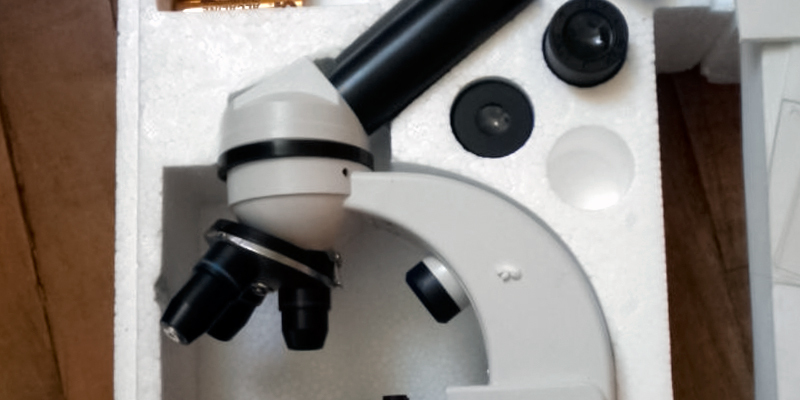 The instrument in question is, of course, a microscope, a key scientific tool that narrows the focus on tiny objects, encourages scientific exploration and discovery, and is ideal for science and investigation in general. 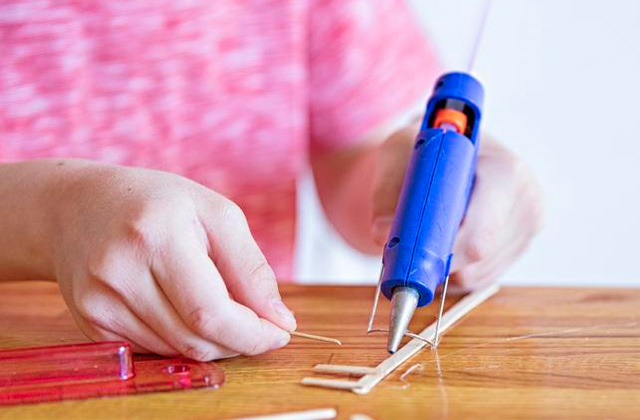 Though the models in question wouldn't be able to match the power of those devices that you'd be able to find in a science facility, what they offer is enough to perform some fun experiments at home and encourage children to pursue a career in science. Of course, if your little one is yet to enter an elementary school, you might consider a different educational tool, like a marble run or a box of kinetic sand. 1. Microscopes – Help Scientists Explore Hidden Worlds, Nobelprize. 2. Microscope Types & Principles, KEYENCE. 3. Microscopes and Cell Imaging Systems, Biocompare. 4. Types of Microscopes, MiamiUniversity.